Getting people together for a reunion can be a lot like herding cats – but we’re here to help! The Chattanooga CVB specializes in reunion planning and our goal is to make the process as simple as possible. 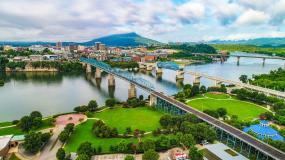 With 100+ full-service, mid-priced, and economy priced hotels to choose from, plenty of unique off-site venues, and a few of the Southeast’s top attractions, there are plenty of opportunities to create memories with family and friends when you reunite in Chattanooga. Step one: Contact us! Give us a call at (423) 424-4459 or shoot us an email. We can provide valuable and complimentary reunion planning assistance, including a packet of information about the greater Chattanooga area and step-by-step guidelines and timelines for reunion planning. After you have determined your dates, expected attendance, and budget, it’s important to decide on the theme and location of the reunion. If most of your extended kin are urbanites, you’ll want to keep a Downtown focus. If your crew is divided between lattes and granola, then staying on Lookout Mountain offers the best of both worlds – peaceful surroundings and adventurous activities all with easy downtown access. If you’re group is chock-full of history buffs, you’ll have plenty to do with visits to Point Park and the Battles for Chattanooga Museum, Chickamauga National Military Park, and the Tennessee Valley Railroad Museum. If you’re staying downtown, you’ll find it’s extremely easy to get from place to place. Walking is always an option, but you can hop on the free electric shuttle or rent a bike from Chattanooga’s bike-share program to get around town. If you want to stay close to the Chattanooga Convention Center, check out the recently renovated Read House or The Westin. 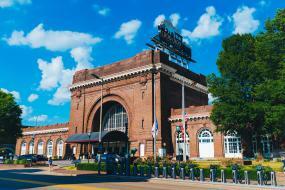 For quick access to the Southside, The Chattanoogan and the Chattanooga Choo Choo are great options. If cottages and cabins are more your style, check out Chattanooga Vacation Rentals. There&apos;s no shortage of activities and things to do, even if you have a big group. Most attractions offer a group discount, making it easy and affordable to explore the Scenic City. A Lookouts game is a great way to get the gang together on a summer night. 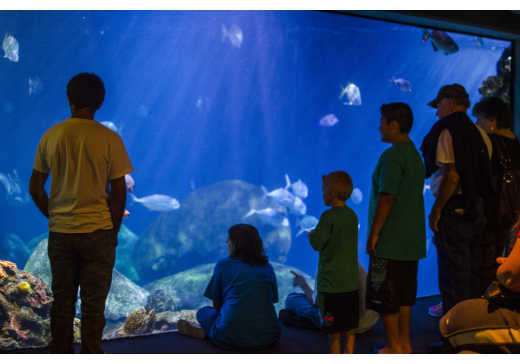 For the kids, a trip to the award-winning Creative Discovery Museum and the Chattanooga Zoo is a must. And no outing would be complete without visiting the Tennessee Aquarium and IMAX 3D Theater. 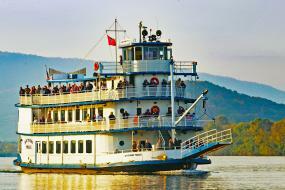 For those wanting to get out on the water, the Southern Belle Riverboat offers sightseeing, lunch, and dinner cruises and the Chattanooga Ducks are not to be missed. These WWII amphibious landing crafts begin on land and then splash right into the Tennessee River for unique views of the Northshore and downtown areas. Art enthusiasts will be surprised at Chattanooga diverse, creative culture. Check out the Hunter Museum of American Art and its magnificent view of the Tennessee River, or pop into the Houston Museum of Decorative Arts and nearby River Gallery. All three are located in the Bluff View Art District, a historic city block filled with restaurants, a coffee house, bed and breakfasts, sculpture gardens, and courtyards. For a more hands-on experience, create your own glass-blown ornament or paper weight at iGNiS Glass Studio. 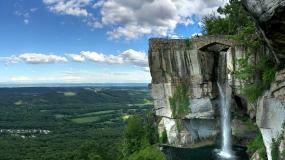 You can’t visit Chattanooga without making a trip to Lookout Mountain. Home to some of the best attractions, outdoor experiences, and views of the surrounding areas, it’s the perfect place for groups to get away from the hustle and bustle of downtown. Take a ride on one of the steepest passenger railways in the world – Lookout Mountain Incline Railway. Known as “America’s Most Amazing Mile,” the Incline’s trolley-style cars climb through the natural beauty surrounding historic Lookout Mountain at a breathtaking 72.7% grade – straight up! After you descend back down to the Incline&apos;s bottom station, explore historic St. Elmo and grab a scoop of ice cream from Clumpies. If you prefer to admire rocks rather than climb them, enjoy the seven-state view at Rock City. In addition to breathtaking views and a trail featuring unique rock formations and gardens, this iconic natural attraction is home to more than 400 native wildflowers, plants, and shrubs. For a subterranean adventure, see America’s tallest, underground waterfall open to the public at Ruby Falls. While you’re there, check out their High Point ZIP Adventure – perfect for family bonding. The suspended obstacle course on the side of Lookout Mountain allows you to skip along the treetops while soaking in beautiful views of downtown Chattanooga. If you’re up for an adventure, explore Lookout Mountain&apos;s hiking trails, rock climbing, or even hang gliding. Top it off with a visit to Reflection Riding Arboretum and Nature Center, located at the foot of Lookout Mountain. A certified level four arboretum, numerous birds and wildlife call the property home including the bobcat and red wolves at the Native Animal Exhibit – a natural area with enclosures for Animal Ambassadors. 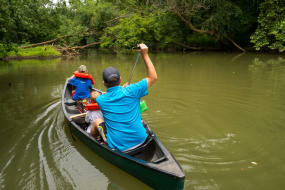 You’ll find 15 miles of trails, water access for canoeing and kayaking, and 300+ acres of forest, field, and stream. Reunion planning can be intimidating, but with a little help from the Chattanooga CVB you’ll be able to focus on what really matters – creating memories that will last a lifetime! Ready to bring your family or group together in Chattanooga? Call Jeannie Tatum at (423) 424-4459 or email HERE.